Moog Animatics has released a free 30-day trial of the SMNC™ application software that includes new and improved features. 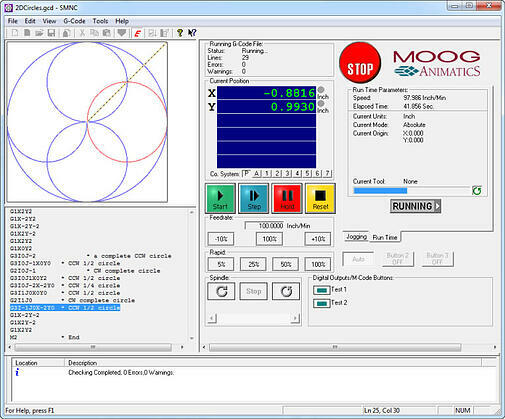 This G-Code based servo motion control software uses numeric control to deliver multi-axis contouring for your Moog Animatics SmartMotor™ projects. SMNC provides a set of features that are comparable to any CNC system, including a user interface that is similar in appearance to a traditional CNC system. It is also compatible with Mastercam® CAD/CAM software. The SMNC™ Free 30-Day Trial is Available Now! Register to download this new application software to improve the productivity and efficiency of your SmartMotor™ multi-axis contouring projects! *Mastercam is a registered trademark of CNC Software, Inc.